Here’s a recipe for a dosa that does not require any soaking, grinding or fermenting. This instant dosa makes an occasional appearance at my place during weekends. I also add different vegetables depending on what I have on hand, to make it more substantial. Set the batter aside for about 20 minutes. Heat a cast-iron skillet/griddle until hot and smear it with a little bit of oil. Pour a ladleful of batter onto the skillet. Lift the skillet off the heat and tilt it around so that the batter distributes evenly. (Spreading the batter into a circle using the back of the ladle doesn’t work well here.) Add a couple of drops of oil around the edges of the dosa, turn down the heat a bit and cover and cook till done. Then flip over and cook the other side. We had it with some onion chutney and chutney podwer. Wowie that looks so crisp. I made one a while ago but added some wheat flour and so on but that was kind of thick. This looks so much nicer. Sounds great and healthy too.Thanks for sharing a great breakfast recipe.Bookmarked. I bought coarse corn meal a few months back TBC, to make makki ki roti, but it was really bitter. Is there a specific kind I should look for ? WOW... This is a nice recipe. Looks so good. Love the deep yellow color. YUM! Hey, I make this too, and love the slight crunch of the corn meal. Never thought of adding vegetables, though. Great idea. This dosa looks simple and easy to me, something on the lines of rava dosa. 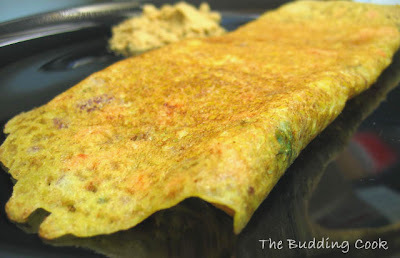 A delicious looking dosa and I love the simple recipe. Thanks! wholegrain cornmeal is so much more delicious and healthier than semolina. i will be making these soon. this kind of dosa looks totally up my alley..now i just need to get hold of cornmeal..
ahh.... looks so crispy and a quick dish it is. dosa with cornmeal sounds so good and it looks so delicious and tempting. This looks really good. I see packets of this in the store and wonder what I can make with this other than polenta! TBC, I couldn't thank you enough!!! I've been drooling over dosas for a long time now but when thinking about actually making them I was put away by the soaking or fermenting steps. This is perfect for me and I'm bookmarking it! This sounds great. I love dosas but haven't ever made them. This seems a bit simpler than other recipes, and I should really give it a shot. I'm just not so good at flipping things. They always come out lumpy or lopsided. What a brilliant use of cornmeal!! What an innovative dosa ingredient- using corn meal. It looks so crisp too. Oooh. You had me at "cornmeal." Those look good. I have been wanting to try dosa's for a while. hi there! is cornmeal same as makkai ka atta (as in makkai roti & sarson ka saag)? the wiki pic looks like a coarser powder. anyways I'll try and get hold of it... nice recipe. my daughter loves godambu dosha (i make that for her several times in a week) so this could be a variation. Rajani- I got a packet of this from the Indian store here. The packet said corn flour (not to be confused with the thickening agent), but we know it as cornmeal. Yes, I believe it is also known as makki ka atta. What I had was similar to the one in the Wiki pic, but it was finer yellow powder. looks like rava-dosa ..i am dying for some! Dosa looks great..Perfect when in a hurry.. I made these for today's dinner and it tasted very good TBC. For making the dosas I followed Vahchef's rava dosa technic and it came out very well. If you are not aware of the above check www.vahrehvah.com and search for Rava Dosa. The video is very easy to follow and we can easily prepare restaurant style rava dosa at home. About this so-called chef you're talking about- he has been known to lift content from different food blogs without asking/giving credit where it is due. Indira's Mahanandi was one of the fist blogs to report this. There have been some instances recently too (I forget the names of the blogs now). Needless to say, I have no respect for him or what he does! Thanks for the information TBC. I was not aware of this at all. I followed to his website from Asha's blog. She had made the rava dosa from there and had linked to his YouTube video. That's how I got to know his website. Thank goodness I was going to blog about the rava dosa and mention him. Later in the evening yesterday I googled his name and plagiarism and found a couple of results.